Aug. 15, 2018 (EcoSophia.net) -- This week we continue a monthly discussion of The Cosmic Doctrine by Dion Fortune, which I consider the most important work of 20th-century occult philosophy. Climb in and fasten your belts; it’s turning out to be as wild a ride as I expected. Revised Edition: Chapter 3, “The Twelve Rays and the Seven Cosmic Planes,” p. 18-22. Millennium Edition: Chapter 2, “The First Trinity,” pp. 26-31, and the first three paragraphs of the following chapter. This is an extremely complex chapter in which a great many concepts are covered very briefly, so we’ll take things a step at a time. We pick up again where we left off, with the three great Rings -- the Ring-Chaos, the Ring-Cosmos, and the Ring-Pass-Not -- all in place. As in last month’s reading, it’s useful for what follows to imagine them at right angles to one another, as shown in the diagram below. The text summarizes the points already made about the three Rings and stresses that only the Ring-Cosmos can create anything because the forces of the Ring-Chaos diffuse outward into infinity. The Ring-Cosmos has a limit -- the Ring-Pass-Not -- which prevents its forces from diffusing; instead, they act and interact among themselves and produce complexity. Notice here one of the fundamental principles of esoteric philosophy: creation requires limitation. To bring something into being is to accept limits. To reject limits is to guarantee that whatever you do will dissolve uselessly into the Void. This is a very difficult concept for most people nowadays to grasp. Now as in Dion Fortune’s time, a great deal of pop spirituality fixates on the notion that limits are always bad and that you can and should free yourself of all limits. There’s a certain value to these teachings since a great many people limit themselves in self-defeating ways. Believing that there are no limits can help people shake off limiting beliefs that they’ve absorbed from their parents, teachers, or culture, and accomplish things they didn’t believe they could do. The difficulty here is, first, that unfairly limiting beliefs aren’t the only kind of limits that exist, and second, that believing that there are no limits itself imposes certain very sharp limits on those who hold this belief. One of the many cats Dion Fortune let out of the bag in The Cosmic Doctrine -- it’s discussed in Chapter 25 -- is the reason why the fixation on limitlessness became so widespread in 20th century pop spirituality: it was one way for occult groups to create a readily accessible pool of force that could be directed by the group’s adepts. There were a number of such gimmicks, and most of the big public occult groups of the time used one or more of them relentlessly, teaching exercises to the largest possible number of novices that mostly functioned as ways to charge the pool of forces, and then selecting from among the novices the few who had the discipline, intelligence, and commitment to become adepts themselves and work with the pool of forces. This doesn’t have to be done in a secretive and abusive manner. The more reputable occult schools, Dion Fortune’s among them, were quite open about what they were doing and explained to participants how their contributions of force would be used. Churches, by and large, used to do the same thing. Read Christian writings about group worship from before the First World War and very often the concept of group prayer as a source of energy is all but spelled out. Of course you then have to have priests or ministers who know what to do with the energy thus collected, and that’s become increasingly rare as today’s churches embrace modern, up-to-date, cutting-edge notions of clergy training that guarantee that the clergy thus trained will be hopelessly ignorant concerning the magical dimensions of the ceremonies they perform. It doesn’t help that many of the ceremonies in question have been revised by people who were guided by fashionable notions of relevance rather than any grasp of magical principles, and that many of the practices given to the laity to guide their end of the work have been abolished or neglected due to reforms with similar motivations. In some denominations, as a result, the services no longer bring in any energy at all, and you get at best a pleasant gathering with some moral platitudes thrown in for seasoning, and at worst one of those undead churches that would not feel noticeably different if the minister and congregation had all been expertly embalmed. In other denominations, the energy still comes in, but since no one knows what to do with it anymore, it sits unused and turns stagnant. It usually ends up discharging through the clergy using the normal outlet of the life force, and you get another sexual scandal. I’m not sure how many people realize that the decrease in miracles and the increase in sexual scandals among clergy have the identical cause, but from the point of view of occult philosophy, it’s obvious. The Cosmic Doctrine, though, was written for those who want to work with power, not for those who simply want to sit in the congregation and contribute power for the person up front to work with. If you want to work with power, you need to understand what, in a later chapter, Fortune will call the Law of Limitation. The principles that underlie that law are the ones we’ve been covering in the two chapters we’ve read already. You embrace limitation when you want to create and sustain something; you release limitation when you want something to dissolve into the Void. As you create and sustain something, though, it takes on unexpected qualities. 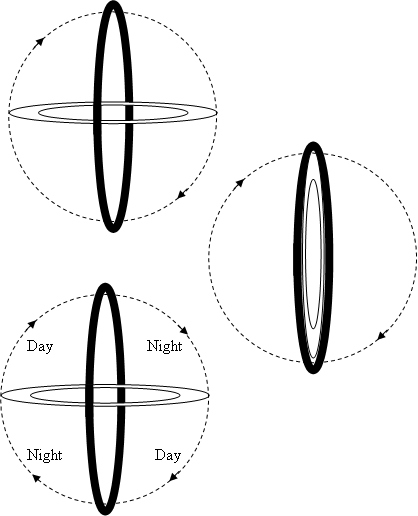 In the metaphoric language of our text, the forces we’re discussing are movements of empty space, but as movement reaches its maximum complexity it produces a second kind of activity, which our text describes as light; when light, in turn, reaches its maximum complexity it produces a third kind of activity, which our text describes as sound. This is one of the places where it’s crucial to remember that The Cosmic Doctrine is a system of metaphors meant to teach occult philosophy, not a physics textbook. In physics, movement doesn’t create light and light doesn’t create sound, except in certain jerry-rigged instances. In the metaphor we’re using, things are otherwise, and it’s worth spending time imagining movement creating light and light creating sound, and then considering what this might mean. One point of the metaphor -- there are others -- is that movement, color, and sound comprise the three primary tools of the operative mage, and are combined in even the simplest magical working. Another point of the metaphor, more broadly applicable than the first, is that activity of one form can cause activity in other forms, and if you’re not paying attention, this can blindside you. As force begets force, and the movements of the Ring-Cosmos flow back inward, the simple spinning movement described earlier breaks apart into a cascade of more complex movements, accompanied by light and sound. The first set of these complex movements are the Twelve Rays, which radiate from the center to the circumference and return to the center again. Our text calls them “a set of revolving spirals,” which may be confusing unless you know that the words “spiral” and “helix” were treated as interchangeable by a great many authors in Dion Fortune’s time. The Rays are streams of force that spin around their own axis of movement as they flow out from the center and return to it, and the meeting of the Rays in the center turns the center into a great cauldron of energies -- in Fortune’s language, the Central Sun. Each Ray is paired with the Ray that flows out in the opposite direction. For the purpose of the metaphor, the energies of the Ring-Cosmos are imagined as a disk spinning around the Central Sun, like an old-fashioned vinyl record around the spindle at the center of the turntable. Of each pair of Rays, one flows out along the upper surface of the disk and returns along the lower, while the other flows out along the lower surface and returns along the upper. “This is a very deep truth, closely related to practical occultism,” notes Fortune. When she says something evasive and portentous like this, by the way, you can take it for granted that she’s hinting at polarity magic, the mode of magical working with sexual energies that was central to her inner teachings. You’ll find the basic theory, including an explanation of what she’s hinting at here, in her book The Esoteric Philosophy of Love and Marriage. So we’ve got the spinning disk of energies with twelve Rays flowing out from the Central Sun and returning to it. 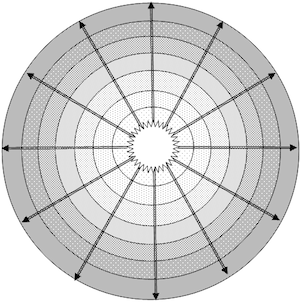 The movements of the Rays then set up stresses in the disk that divide it into seven concentric rings. These are the seven Circles, which are also the seven Cosmic Planes. It’s important not to mistake these for the seven planes discussed in practical occultism; as we’ll see, the Cosmos is the whole of which individual solar systems (in Fortune’s terms, “universes”) are tiny parts, and the seven planes that you and I can work with belong to our own solar system, which exists in its entirety on the seventh Cosmic Plane. With the development of the seven Cosmic Planes the evolution of the Cosmos is complete. The three Rings, seven Planes, and twelve Rays form the background to everything else that happens. (Those of my readers who know anything about the Cabala know exactly where these numbers come from and what they refer to; those who don’t can find the details in Dion Fortune’s book The Mystical Qabalah or my somewhat less evasive book Paths of Wisdom.) It’s what happens within that framework that will concern us from here on in. What happens within that framework, first of all, is that the movements of the Rays as they cross the spinning Circles set off additional movements in space, which our text calls “Tangentials.” The Tangentials are brief movements of space that flow off at various angles, and when there are enough of them in a given region of the cosmos, they collide with each other. (In Chapter 4, Fortune explains that this happens where the Rays intersect with one another to form the Central Sun.) When two Tangentials set in motion by different Rays collide, they deflect each other’s motion, and start spinning around each other, forming a stable unit. Notice here another of the fundamental principles of esoteric philosophy: when you oppose something you lock it into place, and you lock yourself into a relationship with it. Two tangential movements spinning around each other, locked into relationship with each other, and forming a single vortex: this is a prime atom. This is another of those places where it’s important to remember that the Cosmic Doctrine is not a physics textbook; the atoms we’re discussing aren’t the kind that physicists study. They are metaphors, remember, meant to train the mind rather than inform it. The prime atoms are the building blocks from which everything else in the Cosmos is made. Some of them, as we’ll see, remain prime atoms, but others interact with other prime atoms and form composite atoms. The process is the same as the one that formed the prime atoms: two prime atoms collide, deflect each other’s motion, and start spinning around each other, forming a stable unit. The process continues as the composite atoms absorb more influences and become more complex. Eventually, in place of a simple spinning, you get a pattern of motion that approximates an angular figure, with from three to ten sides. The atoms, prime and composite, then sort themselves out through something not too far from centrifugal motion. Those prime atoms that remain unattached stay in the Central Sun. Those that have become composite begin to drift outwards and settle out into one of the seven Circles: the three-sided composite atoms into the circle just outside the Central Sun, the four-sided atoms into the next circle out, and so on, out to the nine-sided atoms, which fill the seventh circle. And the ten-sided ones? We’ll get to those in a later chapter. Toward the end of the chapter, Fortune drops two broad hints. The first is the recapitulation that assigns the numbers 1 through 5 to five different movements covered in The Cosmic Doctrine, and thence to five basic concepts. Those concepts are among other things the first five of the ten Spheres of the Tree of Life, seen from a particular point of view, and those of my readers who know their way around Cabalistic symbolism may find it interesting to explore the Tree of Life from this standpoint. 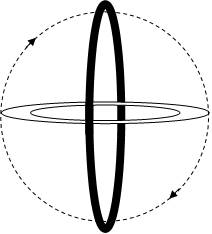 As the Ring-Cosmos rotates, in other words, it gradually approaches the angle of the Ring-Chaos, then passes through that angle and out the other side, diverging from it until it returns to its original angle (though it’s turned over and is therefore upside down and spinning in the opposite direction). Then, as it turns further, it approaches the angle of the Ring-Chaos again, passes through it, and returns to its original angle in its original orientation. This is the basis for what occult philosophy calls the Days and Nights of Manifestation. This is the vastest of all the cycles that shape the Cosmos, the one that governs the rise and fall of universes. The rule here is simple: when the Ring-Cosmos is rotating toward the angle of the Ring-Chaos, that’s a Day of Manifestation, and when the Ring-Cosmos is rotating toward its own angle, that’s a Night of Manifestation. Why? Because the Ring-Chaos is what sets things in motion. 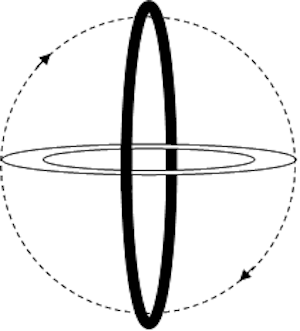 If the Ring-Cosmos were to rotate at its original angle forever, nothing would ever change or grow or evolve; as mentioned in Chapter 2, the Ring-Cosmos unchecked is static in the present moment. The Ring-Chaos provides the force that tips the balance and sets the Cosmos moving. So there are two Days and two Nights of Manifestation in each full rotation of the Ring-Cosmos. Each Day begins as the attraction of the Ring-Chaos overturns the static balance of the previous Night, and ends as those forces set in motion that haven’t established an equilibrium with the rest of the Cosmos are drawn out to the Ring-Pass-Not, the boundary of existence, and dissolve into the Unmanifest. Every Night begins as the remaining forces start to settle into their equilibrium, and ends as the wholly balanced and equilibrated Cosmos is disturbed anew by the attraction of the Ring-Chaos. In itself, even if it wasn’t a metaphor, that would be of limited use to human occultists, who exist in an eyeblink of Cosmic time. What makes this useful is that every smaller cycle in the Cosmos has similar phases. This is true, for example, of the cycles of the day, the lunar month, and the year. Take the lunar month for an example. The period between the New Moon and the First Quarter is favorable for beginning anything new; the period between the First Quarter and the Full Moon is favorable for strengthening and consolidating things; the period between the Full Moon and the Last Quarter is favorable for making changes; the period between the Last Quarter and the New Moon is favorable for ending and letting go. The reference to “the numbers of the secret calendar” is a reference to this. There are various systems for tracking tides of the sort just set out, ranging from relatively simple methods such as watching the phases of the Moon, to maddeningly intricate numerological and calendrical systems that take a lot of study to grasp. The point remains the same, which is that time is not just an undifferentiated flow; it cycles through different phases, and some of those phases are more favorable for certain activities than others. Questions and comments can also be posted here for discussion. (I’d like to ask that only questions and comments relevant to The Cosmic Doctrine be posted here, to help keep things on topic.) We’ll go on to the next piece of the text on September 12. Until then, have at it!